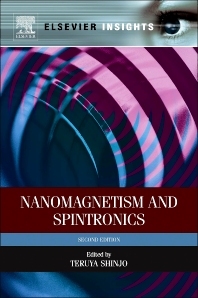 The concise and accessible chapters of Nanomagnetism and Spintronics, Second Edition, cover the most recent research in areas of spin-current generation, spin-calorimetric effect, voltage effects on magnetic properties, spin-injection phenomena, giant magnetoresistance (GMR), and tunnel magnetoresistance (TMR). Spintronics is a cutting-edge area in the field of magnetism that studies the interplay of magnetism and transport phenomena, demonstrating how electrons not only have charge but also spin. This second edition provides the background to understand this novel physical phenomenon and focuses on the most recent developments and research relating to spintronics. This exciting new edition is an essential resource for graduate students, researchers, and professionals in industry who want to understand the concepts of spintronics, and keep up with recent research, all in one volume. Teruya SHINJO is a professor emeritus of Kyoto University, having been engaged in the study of magnetic materials for about 40 years. He is well known from his research on Mossbauer spectroscopy, magnetic thin films and multilayers, and more recently spin-dependent transport phenomena in nanostructured magnetic systems.